Egyptian Obelisk in Istanbul was transported several times before reaching its current location in the Hippodrome (near the Blue Mosque). This monolithic construction was made by the order of Egyptian pharaoh Thutmosis III in 1450s BC. Later, in the year 390 Roman Emperor ordered to transport the obelisk to the Hippodrome of Constantinople and allegedly had it cut into three pieces for easy transportation. The Egyptian Obelisk now located in Istanbul is also known as the Obelisk of Thutmosis III, after the pharaoh who ordered its construction in the 15th century BC. Later, a new name was used - the Obelisk of Theodosius, after Roman Emperor Theodosius the Great who brought the obelisk from Alexandria to Constantinople in 390. Obelisks in Egypt were erected to honor special events or victories of pharaohs. Neighboring rulers borrowed this tradition and ordered obelisks to glorify state-important occasions as well. Roman Emperor Constantius II, for example, ordered to transport the Obelisk from Karnak to Alexandria (territory of Egypt) to commemorate his 20th anniversary as an Emperor. The monument was made of red granite as most of the obelisks. It's a tall narrow construction with four sides and a pyramid-shaped top finishing the structure. All the inscriptions are clearly distinguishable even today. They record victory of pharaoh Thutmose III's over the state of Mitanni (Syria) in 1450s BC. Obelisk was a symbol of sun. The top part ensured catching rays of sun at all times thus honoring the Egyptian sun god. The original obelisk was 30 meters (95 feet) high. Due to several moves the construction you see now is only 19.59 meters in height plus the pedestal it stands on. Only two thirds of the construction from top survived the trip from Egypt to Constantinople. The monument was cut into three pieces for easier transportation. Lower part has been lost or damaged severely during the move, the survived part still stands in the Hippodrome square in Istanbul just the way it was placed by the Emperor in 390. Marble pedestal was especially built for placing the oversees wonder. The entire pedestal is covered with images of imperial household and recorded transportation of the obelisk from Egypt to Constantinople. The Egyptian Obelisk was originally built near Luxor city in Karnak Temple Complex in the southern Egypt. In 357 it was moved 1000 km (621 miles) away from its hometown to Alexandria city in the north of Egypt. Transportation means of such a large object were limited in those times. Naturally Nile river ran between the cities and the obelisk was first moved as one single piece in its original form by the river. The obelisk is located in the heart of touristic Sultanahmet neighborhood at Hippodrome known as Sultanahmet Square. Tours which stop by the Obelisk of Theodosius mainly include visits to the Blue Mosque, Hagia Sophia, Topkapi Palace, Basilica Cistern and other nearby Istanbul attractions in Sultanahmet. 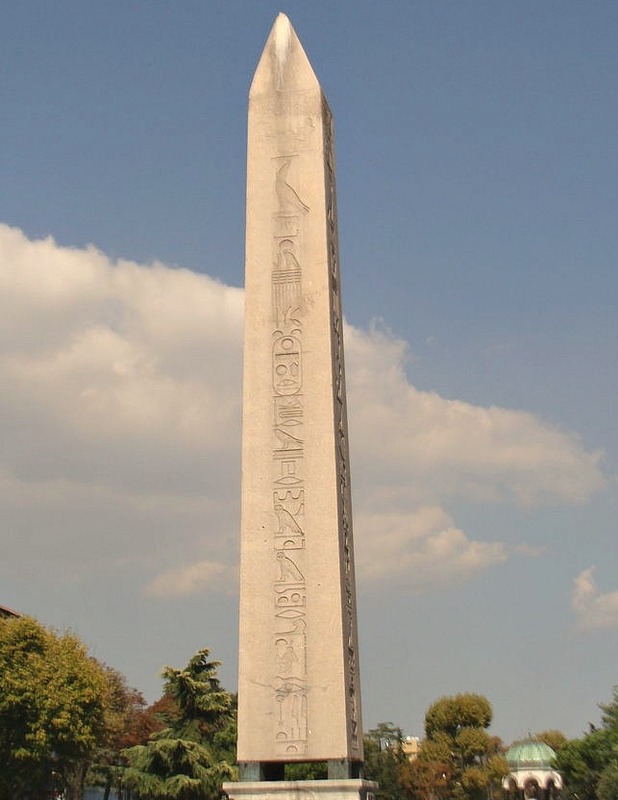 Istanbul boasts only one Egyptian obelisk in the city. Continue your discoveries of these amazing structures in Egypt itself. Egyptian Egyptologyst Labib Habachi is an author of an extensive work The Obelisks of Egypt: Skyscrapers of the Past.